Topped in stretch melange suiting with a flowing crepe skirt, the Waverly Dress cuts an elegantly modern silhouette. The figure-slimming raised waist seam elongates your legs and the subtle racerback armhole adds a contemporary touch. Made in NYC. A-line silhouette with a length that hits just above the knee. Waist seam hits high at the waist. Our model in grey is 5’9 ½” and wearing a size 4. Our model in blue is 5'10" and wearing a size 2. 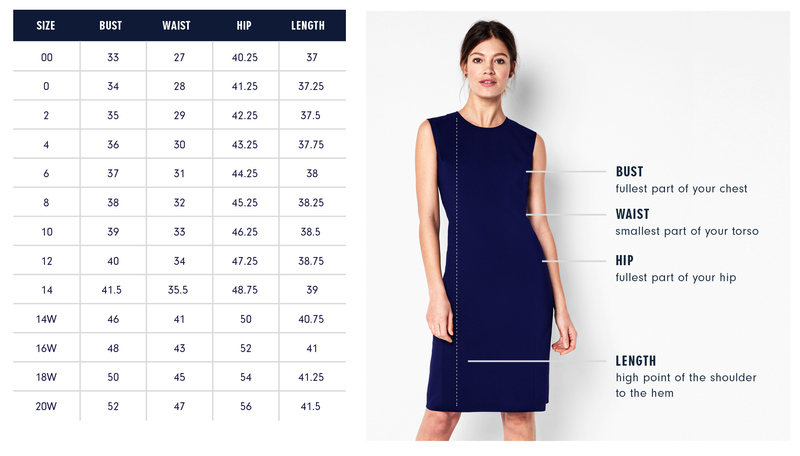 Below are the exact measurements of the Waverly Dress. All measurements are in inches. For general brand fit, sizing, and measurements, please visit our Brand Fit & Size Guide. Our fit model for sizes 14W-20W wears an Of Mercer size 16W. She is 5’8” / bust – 46” / waist – 38 ½” / hip - 48 ½”. Bodice is mid-weight and structured with a dry hand and stretchy feel; skirt is mid-weight with a smooth drape. I carefully considered the placement of the waist seam on this dress. Positioned just slightly higher than your natural waist, it creates a really flattering, elongating silhouette. Features: Fully-lined. Topstitch detail on princess seams and contoured armholes for coverage and movement.